Meet the slimmest electronic lock on the market; the Yale Assure Lock SL. 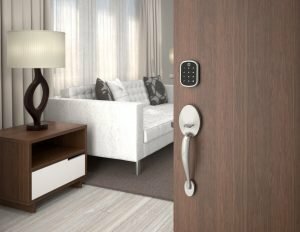 This sleek and modern touchscreen deadbolt allows homeowners to enjoy the convenience of 100% key free locking with the option for smart home and alarm integrations. The lock is available in three beautiful finishes; Satin Nickel, Polished Brass and Oil Rubbed Bronze. You’ll never have to carry around your keys again. Create up to 250 (with module) unique pin codes for friends and family and remove codes whenever you need to. The lock is Grade 2 certified and backed Yale, one of the world’s best known brands in the lock industry that’s been securing homes since 1846, ensuring that your home and family is always safe. The Assure Lock SL can be upgraded with a Yale Network Module (available in Z-Wave Plus, Zigbee or HomeKit-enabled) to integrate into most home automation and security systems so that you can control and monitor the lock from anywhere. Popular integration systems for Yale include; SmartThings, Wink, Alarm.com, Vera and more.